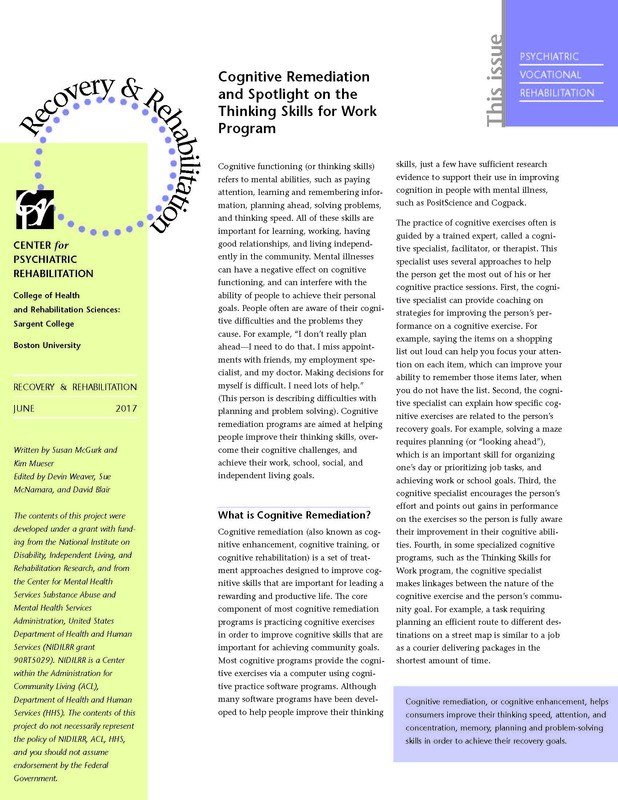 The Newsletter highlights events and programs developed and conducted at the Center as well as current trends in the psychiatric rehabilitation field. Partners in employment focuses on three allies, who help people navigate the world of work: Employers, families, and providers. What is disclosure? What are accommodations? When do I need to disclose to an employer that I need an accommodation? Is it my responsibility to disclose and request an accommodation of my employer? How do I disclose and request an accommodation? Verbally? In writing? Who should I disclose to? How do I know if a company will respond positively to my disclosure? Read more to see the answers to these common questions. Individuals with psychiatric disabilities remain unattached to the workforce in large numbers and are disproportionately represented on the Social Security Disability Beneficiary rolls. Employment rates among individuals with psychiatric conditions are meager and do not appear to be improving in comparison to the general population…. Vocational Peer Support (VPS) is an approach to supporting people with psychiatric disabilities to explore, pursue and achieve vocational recovery. Kim T. Mueser, Ph.D., was recently appointed Executive Director of the Center for Psychiatric Rehabilitation. We interviewed him shortly after his arrival and below are excerpts from that interview. The problem of achieving parity of employment for those who have experienced mental illnesses has been with us for a long time. General guidelines of six principles for conducting technical assistance for employers who are interested in eliminating discriminatory behavior within the work setting. William Anthony, Executive Director of the Center for Psychiatric Rehabilitation, Co-Author (with Director of Training, Marianne Farkas), discusses A Primer on the Psychiatric Rehabilitation Process. The Center for Psychiatric Rehabilitation has long been an advocate of Peer-to- Peer Support. Steve Harrington, a peer, founder, and Executive Director of NAPS, the National Association of Peer Specialists, answered questions about his experience, peer-specialists, and peer-support. Although people with psychiatric disabilities express a desire to work, their efforts to find and keep a job are not always successful. Many factors contribute to lack of success, but one important factor is too often overlooked: negative attitudes in the workplace. Distance education provides an effective budget-sparing solution for training, which is an essential component of effective service delivery. Direct services providers are the key to effective service delivery, yet they may be inadequately prepared for the work they are expected to do. People with lived experience frequently desire support to accomplish their goals. What steps should they take? Personal Assistance Services (PAS) and the Center for Psychiatric Rehabilitation’s Personal Assistance Services Curriculum may be part of the solution. The Center for Psychiatric Rehabilitation has endeavored, through its website, to provide a central location for useful information about some of the major issues facing individuals living with serious mental illness and those who support them in their journey to recovery. The undergraduate experience is the setting for their first attempts at independent and semi-independent living. They are also in an age group where many mental health issues first become apparent. Expertise in as a mental health provider can sometimes get in the way of the most fundamental starting point of a good helping relationship: seeing persons with significant mental illness as people first. One of the driving forces behind the Postdoctoral Research Fellowship is the desire to reconcile the “science to service” gap and the need for rigorous and innovative research. A Recovery Education Program engaging students by using Photovoice to explore health and wellness issues as experienced by adults with psychiatric disabilities. The life span of people with psychiatric disabilities is decreasing at a staggering rate. At present, people with psychiatric disabilities have a life expectancy that is 25 years shorter than that of the general public.